Hakusan, Japan, April 2, 2013 – EIZO Corporation (TSE:6737) today announced the release of the DuraVision FDS1702N and the DuraVision FDS1702NT, two 17-inch monitors that transmit audio and video and connect to PCs over a local area network (LAN). By connecting the monitor to a remote PC over a network, long distance video and audio signal transmission is possible with a single LAN cable or with a wireless LAN. The monitors can be used to control the PC either with a mouse and keyboard connected by USB or with the FDS1702NT’s touch panel interface. In addition, it is possible to connect USB devices such as USB memory, printers, or a DVD drive via the included USB port on a single machine, enabling multiple kiosks access through the network without having to equip each PC individually. The monitors meet the high-speed IEEE 802.11n wireless networking standard ensuring high-speed moving image display and touch panel operation. The monitors can be installed in positions that are difficult to wire, such as suspended from a ceiling or hanging from a wall, or where installation space for PCs is limited. Examples include retail outlet for displaying advertisements and factory production line where the monitor’s resistance to dust and shock will provide further value. Both monitors come with a 1280 x 1024 native resolution and have a brightness of 250 cd/m2 for the FDS1702N and 190 cd/m2 for the FDS1702NT. 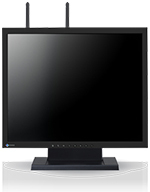 The monitors are backed by EIZO’s 2 year, 24-hour use warranty. The FDS1702NT comes with an analog resistive touch panel which accepts touch input from bare or gloved hands as well as pens. It rarely reacts by mistake to foreign objects such as dust or to being under light sources, making it reliable and stress-free to use. Compliant with IEEE802.11a/b/g/n, 10BASE-T, 100BASE-TX, and 1000BASE-T LAN standards. Compliant with R&TTE directive (European Union) and has FCC/IC certification (USA/Canada) concerning electromagnetic compatibility and radio frequency. Maximum of 6 units of the FDS1702N/FDS1702NT can be connected to one PC via a LAN. Supports connection with USB peripherals such as keyboards and mice. Operates at 0 – 40° C and 20 – 90% relative humidity.